CMAs are pleased to announce the full line up at the awards ceremony. The Cardiff Music Awards recognises the achievements, successes and talents of organisations and individuals who have helped enhance Cardiff’s unique and diverse music scene. Aside from the awards, the CMAs aim to showcase some of Cardiff’s outstanding talent by carefully selecting live acts for their appeal and live stature. Act one is GRL TLK. 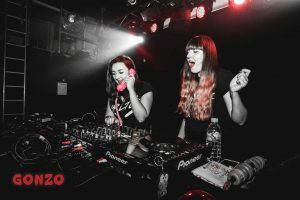 These two girls cut their teeth playing at Cardiff’s best independent clubs and now spin tunes for some of the UK most exciting brands and parties. They have played parties for the likes of Urban Outfitters, Topshop, Warehouse, Grazia and Beyond Retro, plus supporting the likes of Keiza, AlunaGeorge, Zane Lowe and Huw Stephens. Act two is Rainbow Maniac. Shades of 60’s psychedelia, blues-rock and punk permeate the airways when these guys are playing. 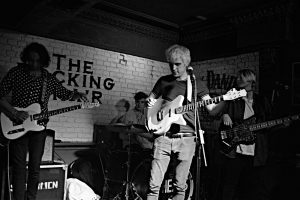 The Cardiff four-piece are big fans of hefty guitar sounds and supercharged, foot to the floor rock and roll, not shying away from bringing their personalities to life with their music. Rousing stuff, absolutely worth flinging yourself about to. The notorious ‘Black Rainbow’ tattoo, branded onto the skin of a few Cardiffians, might lead you to think of Rainbow Maniac as a second-hand Libertines, and as flattered as they would be to hear that, Rainbow Maniac are something brand new. Act three is HMS Morris, a Welsh Art-Pop group that delve into the wonky, odd-ball side of psychedelia, finding the balance between bold experimentalism without giving up accessibility. 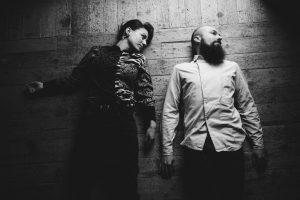 With an undercurrent of post-punk edginess, the group toy with colliding synthesisers and cooing vocals and still manage to create something cohesive and alluring (Clunk). Act four is Afro Cluster. 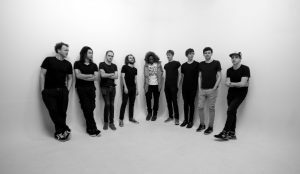 The Cardiff based band renowned for their unique and exciting blend of Afro funk and Hip-Hop. Utilizing cuts, a full horn section and rhythm section as well the MC stylings of Skunkadelic, they’ve been frequently described as having a colossal sound and an explosive live show. After 2016’s critically acclaimed EP ‘We Don Land’, the band is currently writing their debut album for release in the near future. The awards will take place at Tramshed Cardiff on Thursday 29th March 2018, 6pm-late. Tickets go on sale Friday 26th January and are priced at £15.